Mata Daulti Devi Baijnath Prasad Agrawal charitable trust was registered on 10.12.1999 at Daltonganj. Later it was registered as an NGO by the name MDDBPA ( Mata Daulti Devi Baijnath Prasad Agrawal) charitable society under the Society Registration Act 21/1860 Registration No. 769, Registration date 25.09.2010. 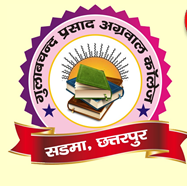 Gulabchand Prasad Agrawal College, Sadma offers various graduate courses as well as Post Graduate courses. Gulabchand Prasad Agrawal College, Sadma is affiliated to Nilamber Pitamber University, Palamu. List of facilities available at Gulabchand Prasad Agrawal College, Sadma for students. This page was last modified on 20 April 2015 at 20:04.